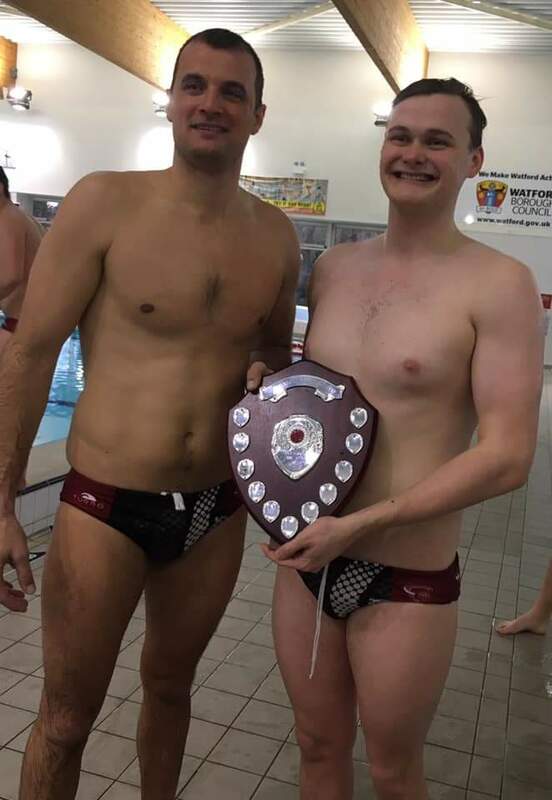 The Watford men’s team started their BWPL Phase Two campaign at Woodside last weekend as the team look to bounce back and win promotion back to Division Two for the start of the 2019-20 season. With 2012 London Olympian Miho Boskoivc in the Watford ranks for the three London derbies against Croydon, WL Penguins & London Otter he inspired his new teammates to earn three important wins. Watford’s Croatian Head coach Edi Brkovic and a long term friend of Boskovic tempted the fellow Croat to come out of retirement and help his side for the weekend. It certainly was a joy to watch Boskovic who was twice crowned “European Athletes of the Year” for 2007 & 2012 following that London Olympic win. Scoring nine goals over the weekend and proving a number of assists to his new team mates he enjoyed his time in Watford. The opening game of the weekend was against Croydon and in the opening quarter Boskovic hit a hat-trick & a goal from Danny Davis gave Watford a 4-1 lead. The second quarter was a tighter affair as Watford snatched it 3-2 to increase their lead at half time 7-3. Another goals from Boskovic and one each for the Pickford brothers Jack & John. Into the second half & Watford continued to control the game as they won the third quarter 4-3 and draw the last 3-3 for a comfortable opening win at 14-9. Boskovic capped off a fine display with his fifth of the game and with doubles from Nandi Cesh & Wayne Davis along with another John Pickford goal and one from Junior Adam Page Watford cruised to victory. The second game of the day was against West London Penguins and they were out to make things tough for our new Croatian team mate as they managed to get him excluded twice in the opening quarter however Watford took the quarter 3-1. Goals from our Hungarian duo David Koncz with a brace & an effort from Cesh did the damage. The second period saw Watford score six to Penguins three as the score moved to 9-4 at the half-way point. Danny Davis & Cash both with a brace & goals from Koncz & Boskovic. The second half saw Watford increase their lead further with a 2-1 score-line for 11-5. the two goals came via Jared baker & Jack Pickford. The last quarter and Watford took their foot off the gas as they lost 2-4 but won their second game of the day. The two final goals came from Cesh & Koncz as they both scored four apiece. Sunday afternoon and a game against London Otter and we didn’t have it all our own way as Otter had a slender lead at the half way point at 5-6. Watford had won the opening quarter 4-3 thanks to goals from Boskovic, Cesh, Jack Warman & Petar Djordjic. Otter had turned the game around at one point going from 4-3 down to 4-6 up but a goal from Koncz just before half time seemed the flow of Otter goals. HT 5-6. Into the second half and Watford hit Nine to Otter’s three as the team hit back to claim their third win of the weekend with a 14-9 victory. Watford’s U18 Serbian Centre forward claimed a last quarter hat-trick, Boskovic a brace and goals from Cesh, Koncz Warman and Danny Davis completed the scoring. Watford’s squad during the weekend (Goals in Brackets): Peter Pickford (GK), Jack Pickford (2), Nandi Cseh (8), Miho Boskovic (9), Jared Baker (1), Danny Davis (4), David Koncz (6), Cameron Baker, Wayne Davis (2), Petar Djordic (4), John Pickford (2), Jack Warman (2), Adam Page (1).